Gary Jenkins has always been interested in the trails that ran through town before Kansas City was even on the map. He volunteers on camping trips with teenagers from the Kansas State School for the Blind along the Oregon Trail. And near his home at 44th Street and State Line Road in Kansas City, Missouri, a sign denotes the crossing of the Oregon and California trails. His fascination with these early interstates led him to hypothesize that Westport Road might’ve been part of the trails at one time, given its meandering path. He got to wondering if Westport Road served as a magnet for people and businesses, just like suburban roads of today, such as Noland Road in Independence and Metcalf Avenue in Overland Park. 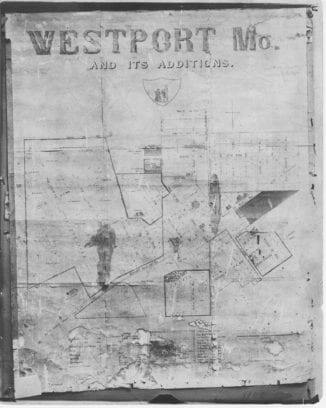 Jenkins asked curiousKC how the city developed along the early trails, and we found that Westport truly was the gateway to the west. His question harkens back to the time of Missouri statehood in 1821. Missouri was then part of the country’s western border, largely because the Indian Removal Act of 1820 designated all lands west of the state as Indian territory. The land was supposedly off limits to white settlers. Yet they pushed westward anyway, driven by the concept of Manifest Destiny, which held that continued expansion of the United States was essentially a God-given right. Wagon trains went west and settled on federal lands, slowly moving into Indian territory. Independence, Missouri, was the original disembarkation site for steamboats carrying settlers on the Missouri River. Just a few miles from the port, passengers could purchase supplies to prepare for their journey west. But reaching Independence required a treacherous trip up the Blue River, and once you arrived, the landing was small. So, by the 1840s, Westport Landing emerged as the new hopping-off point for western settlers. One benefit of Westport is that it was 12 miles down river from Independence, shaving off a little bit of the land journey to the west. This spot eventually became the embarkation point for the Santa Fe, Oregon and California trails. From this landing, people could travel a few miles south to Westport, which boomed as a commercial center for both settlers and Indians, who had received funding from the Indian Removal Act. The town’s population peaked at about 2,000 people in the late 1850s. As Jenkins noted, most Kansas City streets run north-south or east-west. But Westport Road is different. It runs at nearly a perfect diagonal between Main Street and Southwest Trafficway. The cross streets are set at diagonals and curve unusually as well. This is probably because the heart of the town originally was located at Westport Road and Pennsylvania where, John McCoy, its founder, built its original inn in 1831 and platted the town in 1835. From this hub, the town is thought to have developed along a small stream that ran through the city. It wasn’t until after the Civil War that Kansas City, also platted by McCoy, became the larger city. 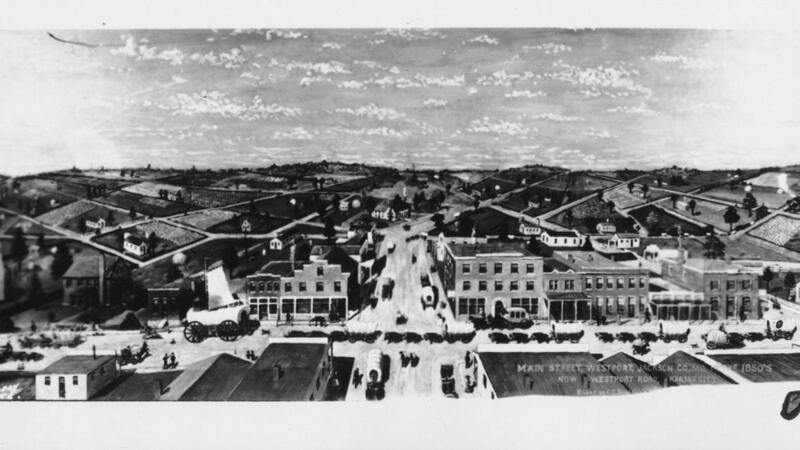 Westport began to decline and was annexed into Kansas City in 1899.